No Life 'til Metal - CD Gallery - Sweet F.A. Midnight Priest are a heavy metal band Portugal formed in 2009 who are part of the worldwide New Wave of Traditional Heavy Metal movement. This was the first thing that I had heard from the band and what attracted me to them was that cover art. Fantastic old school painting that looks like Boris or Frazetta. As well, the fact that StormSpell Records released this EP gave me some confidence as this label rarely releases a dud. 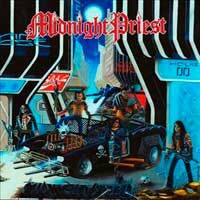 Midnight Priest's sound is straight forward heavy metal with a slant towards speed metal. The band is very obviously and unabashedly influenced by the New Wave of British Heavy Metal. The EP starts off with two of the strongest tracks in the title track "Rainha Da Magia Negra" (Queen Of Black Magic) and "Juizo Final" (Final Justice). Both are full of heavy riffs and tasty guitar licks. The guitar work and the songwriting are the bands strong point. Vocals by "The Priest" are slightly raspy and sung in the bands own native tongue of Portuguese. At times his voice reminds me of Paul DiAnno, but he is far from a clone. The album ends on a strong note with "O Conde" (The Count), an up-tempo metal number with some early Iron Maiden influences. Midnight Priest are a New Wave of Traditional Heavy Metal band from Portugal. "Midnight Steel" is their second full-length album and is the first album with English lyrics rather than their native language, which should bring the band a wider audience. "Midnight Steel" is packed full of everything you would expect and want from a NWOTHM band; big hooky riffs, up-beat song tempos, galloping rhythms, dual guitar parts, fiery lead guitar work and the mandatory cliché metal lyrics. Had this band been around in the 80's or even in the musically depressed 1990's they could have been contenders. As it stands now they are one in a crowded pack of bands reviving the greatest era of heavy metal, along with Striker, Old Wolf, White Wizzard, Holy Grail, and many others.